Apparently, it was broadcast on Murdoch's SKY TV several times. I've googled for it but come up with nothing other than "W" reelection underwear. Can anyone find an image? 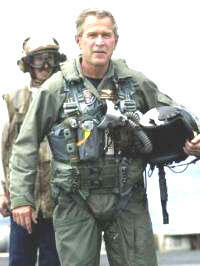 You really want to see Bush in his tighty-whities? Here, you can get your groove on with this in the meantime. Is really someone interested by this movie ? Of course. You clicked into my thread so you are too. I am interested if there's anything discernible writing on his underwear such as "Jesus lives here". They were aweful quick to get the images pulled from the airwaves. There are reports that the tabloids have published them despite the ban. I'm still trying to figure out why anyone cares about this at all. Isn't that just a freaking t-shirt? I was mildy intrigued if he was wearing some kind of weird Masonic/Skull & Crossbones Society sacred vest thingy or something equally mock-worthy.